Harrison's High Potency Coarse is a certified, nutritionally balanced food, suitable for regular feeding all year round. Your birds are guaranteed to benefit from this dietary formulation and its coarse form will allow for regular pecking throughout the day, thus resulting in a slow-releasing sustenance. It is ideal for all medium to large parrots, especially African greys, cockatoos, large conures, eclectus, macaws and pionus. 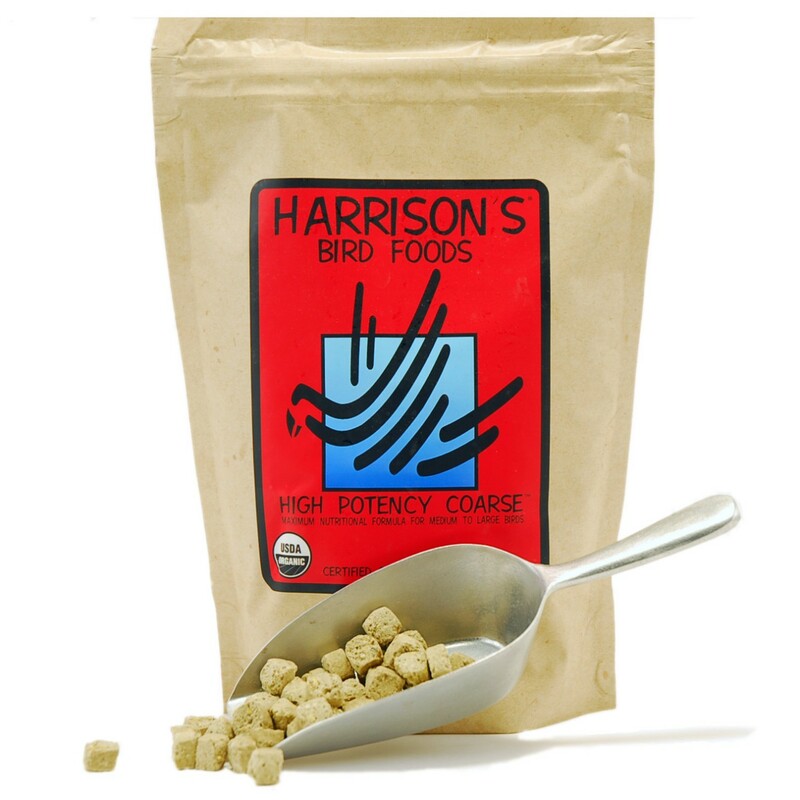 Below are some recent questions we've received regarding Harrison's High Potency Coarse Bird Food, including answers from our team. I have tried my young sun conure on high potency fine but he won't touch it . He seems to prefer larger pellets . Can I feed him high potency course and for how long . It is perfectly OK to use coarse pellets for ever if you wish, the size has only a small effect on nutritional value, it is more for ease/preference/personal choice. The high potency however is too high in fat to use throughout life. It is good for young, growing birds and adults while breeding. At other times it is best to use the Lifetime product, which contains markedly less fat. If your bird likes the larger pellets then I would gradually switch him to Harrisons Adult Lifetime Coarse. You will find that he prefers the original food because the fat is like me adding cream to a cake or butter to bread - it just tastes nice. That does not make it better nutritionally though. You will probably have to mix the two types of food together for a while and gradually reduce the amount of the high potency to zero. Hunger is the best way of encouraging the eating of different foods. Otherwise, if your bird can always fill up on fatty food, that may maybe what he always wants. Post and packing is free to most of the UK if you spend more than £29. If you spend less, then it costs £1.95 for a total weight up to 2kg (so up to 4 of the small sized packets) or £3.95 for weights over 2kg. You can always check delivery options and costs by putting items into your shopping basket, then scrolling down the page and entering your post code. You can then choose to add or delete products, or abandon your whole order as you wish.